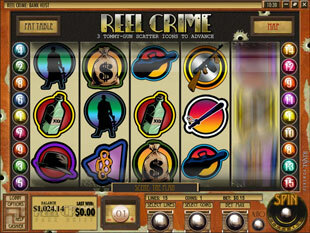 Reel Crime 1 Bank Heist Slots is a 5 reel 15 paylines video game released by Rival. This i-slot offers you to create your own story while you are playing as well as win the top jackpot of 750 coins that can be increased up to 3,750 coins during bonus rounds. Being an i-slot this game consists of three stages. Each of them can bring you various prizes and bonus games. On the whole, this game provides you with such bonus features as Free Spins, multipliers and various bonus games to win more impressive prizes. 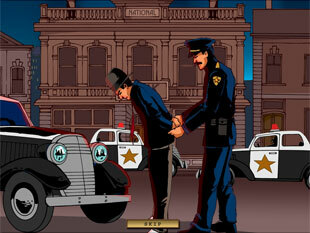 If you prefer art masterpices to big cash try Reel Crime 2 Art Heist slot. You can play this game in no download version. All you need is Internet connection and you can play this slot directly through the browser without installing special software on your computer. Now you act as a gangster and your aim is to rob a bank and run away. There are three stages – The Plan, In The Bank and On The Run. You can see the map of the game any time you want just clicking its symbol in the right corner above the reels. During the first stage you will be guided by such stylish icons as Night Stick, Gangster, Money, Poison, Violin Case, Hat, Shoes, Brass-knuckles, Tommy Gun. You can choose among such coin sizes as $0.01, $0.05, $0.1, $0.25, $0.5, $1.00. The minimum bet that allows you to cover all 15 lines is $0.15 while the maximum bet of this game is $75. 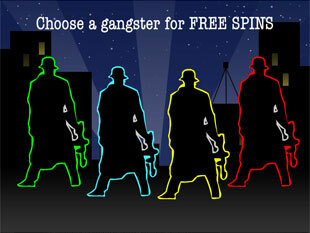 The highest jackpot is 750 coins or $3,750 for 5 Gangsters. The second jackpot is 500 coins or $2,500 for 5 Money. The third highest jackpot is 250 coins or $1,250 for 5 Poison or for 5 Violin Case. The Tommy Gun is the scatter symbol. Get 3, 4 or 5 Tommy Guns on the reels and multiply your bet by 1, 2 or 35 times accordingly. Thus, you can get up to $2,625 per spin if bet maximum $75. 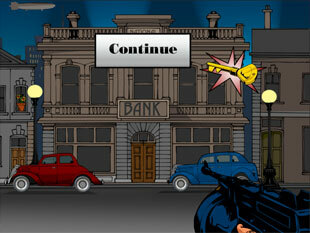 The other good news is that three or more Tommy Guns can activate the second level of the game – Outside the Bank. However, you also should win such an opportunity. 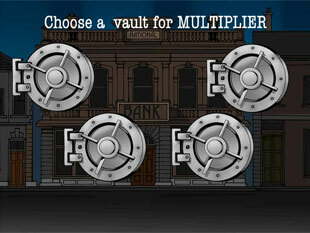 In case you get the second stage, you have two other scatter symbols – the Police Officer and the Bank Vaults. 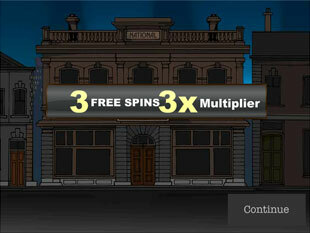 Spin 3, 4, or 5 scatters on the reels and multiply your bet by 2, 10 or 500 times respectively. In other words, this time you can get up to $37,500 per spin if bet maximum $75. And the last stage also presents you two scatters – the Dynamite and the Getaway. Both of them can present you the same cash prizes as the Police Officer and the Bank Vault – up to $37,500 per spin as well as various bonus games to enjoy. And of course, each of these symbols can trigger the next level of the game. The only exception is the Police Officer who pulls you back to the beginning. Anyway, it is his job. So, try to get the right combination of these icons during different stages. Tommy Gun Bonus Game. 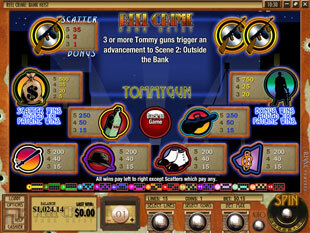 By hitting three or more Tommy Guns on the reels during the first stage of this i-slot you activate Tommy Gun Bonus Game. You should shoot at the targets and win cash prizes for each successful shot. The most important thing is to shoot at the target and find the key to the vault that triggers the next level. However, if you shoot wrong target you will be sent back where you started. Free Spins. This bonus feature is available only for those who get to the latter stages of the game. All you need is to get 2, 3, 4 or 5 Dynamite icons on the reels to activate 1, 5, 10 or 25 Free Spins accordingly. The other good news is that all the prizes are multiplied by 5 during this feature. Thus, you can get up to 3,750 coins or $18,750 for 5 Gangsters this time. Even if you didn’t manage to get another level and police caught you, you still have chance to start the game with interesting awards. 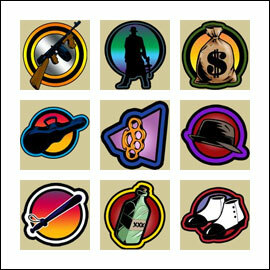 Thus, in case you get the right combination of Getaway icons you will trigger the bonus game where you should choose a silhouetted gangster and a bank vault to reveal Free Spins and multiplier you have won. With so many bonus games to enjoy this i-slot is exciting to win. 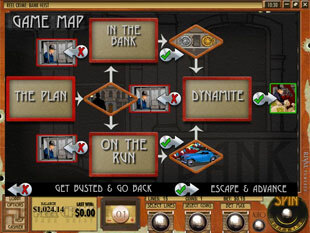 Reel Crime 1 Bank Heist slot machine is an absorbing and thrilling game that presents you the opportunity to create your own story as well as to win impressive prizes up to 3,750 coins or $18,750 and more. 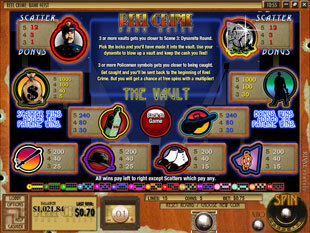 Numerous bonus features invite you into the various levels of the game with more chances to win and have a good time.